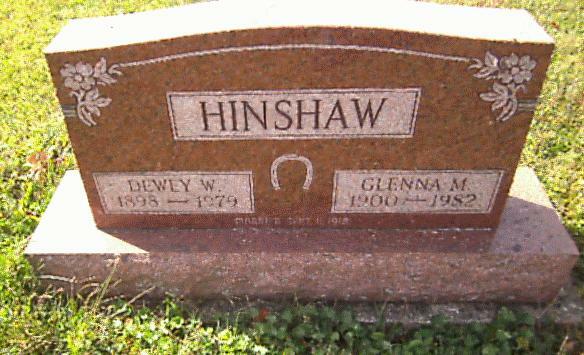 Hinshaw, Dewey W., head-of-household, age 32, born in Indiana; parents born in Indiana; first married at age 20; rented home; no radio in home; occupation: farmer, general farm; not a war veteran. Hinshaw, Glenna M., wife, age 29, born in Indiana; parent born in Indiana; first married at age 18. Hinshaw, Clarence W., son, age 10, born in Indiana; parents born in Indiana; attended school. Hinshaw, Mary E., daughter, age 6, born in Indiana; parents born in Indiana; attended school. VanPelt, Chester, boarder, age 34, born in Indiana; parents born in Ohio; single; occupation: laborer, state highway; not a war veteran. Hinshaw, Dewey, head-of-household, age 42, born in Indiana; completed 8th grade; on Apr 1 1935 was living in the same county/place; owned farm ($2000 value); occupation: farmer, farm. Hinshaw, Glenna, wife, age 40, born in Indiana; completed 4 years of high school; on Apr 1 1935 was living in the same county/place. Hinshaw, Clarence W., son, age 20, born in Indiana; completed 4 years of high school; on Apr 1 1935 was living in the same county/place; occupation: moulder, mold shop; worked 52 weeks in 1939; $640 wages in 1939. Hinshaw, Mary E., daughter, age 17, born in Indiana; completed 3 years of high school; on Apr 1 1935 was living in the same county/place; attended school. 1940 census, Washington Township, Randolph County, Indiana; roll T627-1089, ED 68-17, page 2A, line #2, household #24. Contribution from Margo McPhee ().